The Marine Corps is looking at putting Marines and helicopters on the ships of foreign allies because the U.S. Navy can't provide enough amphibious support for the Corps' missions, a Marine general tells USA Today. The initiative is a stopgap way to deploy Marines aboard ships overseas until more American vessels are available, said Brig. Gen. Norman Cooling, deputy commander, U.S. Marine Corps Forces Europe and Africa. The Marines will be able to respond quickly to evacuate embassies or protect U.S. property and citizens, a need highlighted by the 2012 attack in Benghazi, Libya, that killed four Americans, including the U.S. ambassador. "There's no substitute for U.S. amphibious" vessels, Cooling said. "We're looking at other options" in the meantime, he added. The Marines have been working with Spain, Italy, the United Kingdom and other close allies to determine the suitability of the foreign ships for U.S. personnel and aircraft. This is not the first attempt by the Marine Corps to deal with the shortfall in amphibious vessels in an unconventional way. Earlier this year, for example, it was reported that the Marine Corps had already begun running limited operations off of Navy supply ships that are crewed by civilians. Among the interesting elements of this morning's report is the way in which the Marines are making no effort to dress up the effort to use foreign ships as some sort of partnership effort that benefits the United States. Instead, Cooling paints a concerning picture of a Marine Corps desperate to fulfill operational requirements but lacking support from the Navy to do so. There is an inside-baseball element of recent Department of Defense history to this. 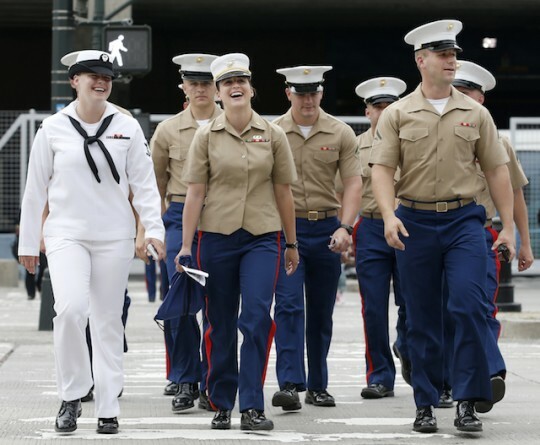 Marine-friendly critics of the Navy have long been frustrated with what they perceive as the Navy's reluctance to fully support the Marine Corps' amphibious mission, preferring to purchase and operate ships that serve other purposes instead. But there is a larger strategic question here. Why does the Navy have to choose between supporting the Marine Corps and its other major requirements? We live in a world with too many serious crises to count, many of which could require the swift intervention of the sort of light, flexible teams in which the Marine Corps specializes. Supporting such a mission is obviously not the Navy's only priority, but sufficient funding should be available—and better streamlining of the DOD's absurd waste in other areas should be demanded—so that the Navy isn't forced to choose between important operational demands. You mentioned the Navy, for example, and that we have fewer ships than we did in 1916. Well, Governor, we also have fewer horses and bayonets, because the nature of our military’s changed. We have these things called aircraft carriers, where planes land on them. We have these ships that go underwater, nuclear submarines. And so the question is not a game of Battleship, where we’re counting ships. The president's supporters loved it, almost as much as they loved his zinger from the same debate, that, "the 1980s are now calling to ask for their foreign policy back." That remark was intended to make fun of Romney's earlier claim that Russia was the United States' "number one geopolitical foe." The president was wrong on both counts. Russia is in fact a major geopolitical foe, one that shows nothing but contempt for a liberal, rules-based international order. And the Navy really doesn't have enough ships, to such an embarrassing extent that the Marine Corps is now looking to hitch rides with Spaniards, Italians, and Brits. This report shows that our military has reached a genuinely pathetic milestone, and there is no sign that the administration has any interest in stopping the decline. This nation has enough wealth to give that Marines what they need without forcing the Navy to scale back on its other priorities. Which Republican candidates will make defense spending, and the security and international leadership it purchases, a foundation of their campaign? This entry was posted in National Security and tagged Barack Obama, Defense Budget, Marines, Navy. Bookmark the permalink.